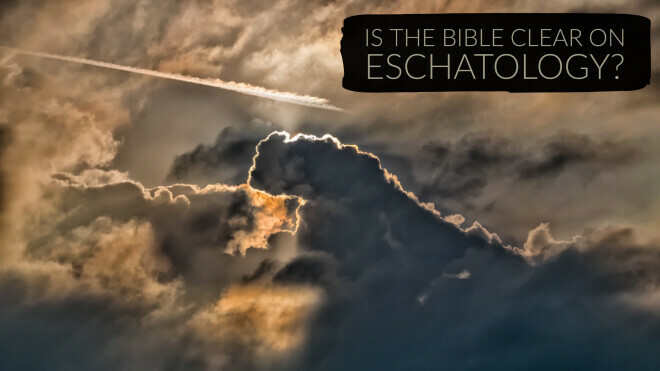 Home » Blog » Is the Bible Clear on Eschatology? I was recently asked by a local pastor to speak to his church on the subject of the end time events, and specifically address the pre-tribulational, pre-millennial perspectives. The pastor stated that he believed and taught alternative views but felt that he must give his people “another look.” I had a wonderful evening with this pastor and his church tackling one of my favorite themes of the Scriptures! At the heart of the discussion is this question: Is the Bible clear about the end times? Or, to put it another way, has God exercised purposeful ambiguity to shroud the future events of world history? I would like to suggest that the end time events written in the biblical testaments are neither briefly developed nor immediately palpable, but they are clear! Let me explain. It is imperative that both biblical testaments be carefully considered when uncovering truth about the end times. What the “older testament” declares as God’s plan for the future is substantiated and illuminated in the “newer testament.” God’s plan is on course exactly as He “promised beforehand through his prophets in the holy Scriptures” (Romans 1:2). To more deeply develop this imperative, there are two crucial questions that must be answered within the context of both testaments if one is to accurately and clearly understand God’s future events for this world. First: What is the kingdom of God? In his book The Greatness of the Kingdom, Alva J. McClain correctly describes the kingdom of God as “the central theme of all holy Scripture” (pg. 5). While the “universal kingdom” of God relates to His sovereign providential control over all things created, the “earthly kingdom” is the active, immediate, literal rule of God on this earth. This earthly kingdom was promised in the OT (Daniel 2:17-30; 7:13-14), announced as “near” by John the Baptist and Jesus (Matthew 3:2; 4:17), and deferred when Jesus was rejected by the nation of Israel (Luke 19:11-27). And upon His earthly return, Jesus will set up His physical rule on the throne of David as detailed in both testaments (Isaiah 9:6-7 with Luke 1:31-33). McClain properly concludes, “It is in this kingdom that the Father’s eternal purpose in the incarnate Son shall be certainly and completely fulfilled” (pg. 5). Second: What is the wrath of God? The wrath of God has two future phases upon which both testaments agree. The first phase is a period of time when the world will experience God’s judgment. This is termed by the prophet Zephaniah as “the great day of the Lord” and “a day of wrath” (1:14-18). The prophet Jeremiah notes two specific features, “that day is so great [fierce] there is none like it,” and it will be “a time of distress for Jacob who will be saved out of it” (30:1-11). The Apostles John and Paul are in full agreement with all the OT prophets. While John spends several chapters detailing “the great day of the wrath of God and the Lamb” upon the earth (Revelation 6-18), Paul quotes from the severe judgment passage of Isaiah 59 and declares a significant purpose for this terror: to save all Israel (Romans 11:25-27). The second phase of God’s wrath is the eternal destiny of the unregenerate in the place of torment, called by John “the lake of fire” (Isaiah 66; Revelation 14, 20). Both John and Paul make it clear that those who “have now been justified by [Christ’s] blood … will be saved from the wrath of God” (Romans 5:9 with Revelation 3:10). In summary, before the Day of Wrath, God’s people - His church - will be saved from its events of terror. As one studies the Kingdom of God and the Wrath of God in both testaments, it seems that God has clearly unveiled His plan for the world for at least two reasons: to warn all people of the coming world-judgment/wrath of God (Revelation 6:17; cf. 2 Peter 3:4-9), and to encourage the saved that they will be protected from these terrifying judgments and will eternally enjoy their kingdom inheritance as the “Bride of Christ” (Revelation 19:6-10).